President Obama fails to mention poverty in his State of the Union address, even though 46 million Americans are living in it. Why’s that so important? Because for a record 46 million Americans, including 22 percent of all children, that’s what they are living in—less than $22,300 annually for a family of four. Yet in a sixty-five-minute address describing the state of the union, President Obama decided it merited barely a mention. Got that? Great teacher, poverty, child who dreams. We good? Obama is hardly alone in his aversion to what Peter Edelman—a Georgetown Law professor and former aide to Senator Robert Kennedy—refers to as “the p-word” in his upcoming book, So Rich, So Poor. In Congress these days, most legislators will talk about the homeless if they happen to be homeless veterans, or maybe even “the most vulnerable,” but it’s ix-nay on the overty-pay. The president said very clearly, “This Nation is great because we get each other’s backs.” But in his State of the Union address on Tuesday night he failed to get the back of 46 million Americans. Residents without health insurance: 21.3 percent, 3rd worst in US. Unemployment rate (avg. month, 2010): 11.5 percent, 5th worst in US. Food insecurity: 16.1 percent, 8th worst in US. Food hardship: 30 percent, 4th worst in US (including DC). Households lifted above poverty line by SNAP (food stamps): 10 percent. Employees with paid sick leave: 55 percent, 9th worst in US. Affordable housing: 38 affordable units per 100 tenants at/below 50% FL median income, 2nd worst in US. Homeless population: 56,687, 3rd most in US. CA + TX + NY + Florida = 40 percent of total US homeless population. Peace Index: 4th least peaceful state in US. Because there is no Department of Labor at the state level in Florida, workers there are particularly vulnerable to abuse, including wage theft. That’s why South Florida Interfaith Worker Justice worked in coalition with immigrant rights organizations, women’s and faith groups, labor unions, legal services providers and others to pass the Miami-Dade County Wage Theft Ordinance. The law allows workers to file a complaint so that the county can pursue deadbeat employers and get them to pay up. Since November 2010, nearly $1 million in stolen wages have been collected for just over 500 workers, with $1.5 million in claims pending. Community groups and advocates in other jurisdictions around the nation are using the law as a model for helping to ensure workers are paid the wages they earn. However, the first day into the Florida legislative session, House Republicans introduced a bill that would make it illegal for cities and counties to help workers recover unpaid wages—even though Florida is just one of five states self-reporting that it has no state agency enforcing wage and hour laws. The coalition that won this important victory for workers is now fighting the state bill that would preempt the county ordinance. This fight isn’t important just for workers but also honest businesses competing at a disadvantage with employers who cut costs by cheating on wages. Local governments and economies also suffer when victimized workers are forced to turn to public assistance and also have less disposable income to spend in their communities. You can get involved in the Dade-County fight and similar efforts around the country. In Florida today, farmworkers receive an average of fiifty cents for every thirty-two-pound bucket of picked tomatoes, a rate that has changed little since 1980. That translates to picking 2.25 tons of tomatoes in order to earn a minimum wage in a typical ten-hour work day. Because farmworkers were intentionally excluded from New Deal reforms they have no right to organize or bargain collectively. In the worst cases, a lack of worker protections leads to outright slavery. The Coalition of Immokalee Workers (CIW)—a farmworker organization in tiny Immokalee, Florida—has been recognized by the State Department for helping federal officials successfully prosecute six slavery operations involving over 1,000 workers in Florida’s fields since 1997. Now CIW has embarked on a thus far remarkably successful campaign to promote fair wages and human rights in the fields, and socially responsible purchasing in the retail food industry that advance the rights of farmworkers. Members of the Florida Tomato Growers Exchange—representing 90 percent of the state’s tomato growers—are on board, as are nine retail food industry leaders, including Whole Foods, McDonald’s and Subway. The retailers require suppliers to meet specified labor standards and pay a price premium for the more equitably produced tomatoes. A lot of Floridians, citizens across the country, and around the world, are letting Publix know that they beg to differ. You can get involved with CIW and send a message to Publix that it’s time for it to stop turning a blind eye to the exploitation of farmworkers here. Senator Bernie Sanders, chairman of the Subcommittee on Primary Health and Aging, introduced a bill to reauthorize the Older Americans Act which supports Meals on Wheels, home-care, job-training and legal services. It couldn’t come at a more critical time. Sanders notes that 10,000 Baby Boomers turn 65 every day. One in five seniors survives on an average income of just $7500 a year. According to research sponsored by the Meals On Wheels Association of America (MOWAA) Foundation, nearly one in seven seniors—7.5 million people—face the threat of hunger. Low-income seniors are more likely to be at-risk, but half of all at-risk seniors have incomes above the federal poverty line. African-Americans and Hispanics are disproportionately impacted, but two-thirds of hungry seniors are white. Young seniors between the ages of 60 and 64 are more likely to be hungry as well. Sanders called reauthorization not only “the moral thing to do, but it also makes financial sense for our country.” These kinds of programs often prevent government spending on much more expensive care in hospitals. In fact, Meals On Wheels reports that it can provide meals to an individual for a year for approximately the same cost to Medicare of one day in the hospital or ten days in a nursing home. Significantly, Sanders’s reauthorization instructs the Bureau of Labor Statistics to improve how it calculates inflation for the elderly, taking into account healthcare and prescription drug costs, for example. A more precise cost-of-living measure would help ensure that funding for these programs keeps pace with real world needs. It could also be used to make more accurate annual adjustments in Social Security benefits. The Metro Trends research team has created an interactive map revealing the employment trends since the end of the recession (6/09) in sixteen job sectors for the nation’s largest 100 metropolitan areas. About 25 percent of US workers are in low-wage jobs, significantly more than other wealthy nations. For most low-wage workers, these jobs aren’t so much stepping-stones to better wages as they are “a persistent and recurring state.” This report draws five lessons on low-wage work from the US and other rich economies in the Organization for Economic Cooperation and Development (OECD). States with a greater percentage of union members have significantly higher voter turnout rates, as well as higher minimum wages, a greater percentage of residents covered by health insurance, stronger social safety nets, and a more progressive tax code. Massachusetts Tenure: A Mitt Presidency Preview? If Mitt Romney’s four years as governor of Massachusetts are any indication of the impact he would have as president of the United States, the near-poor and those struggling to stay in school are in trouble. 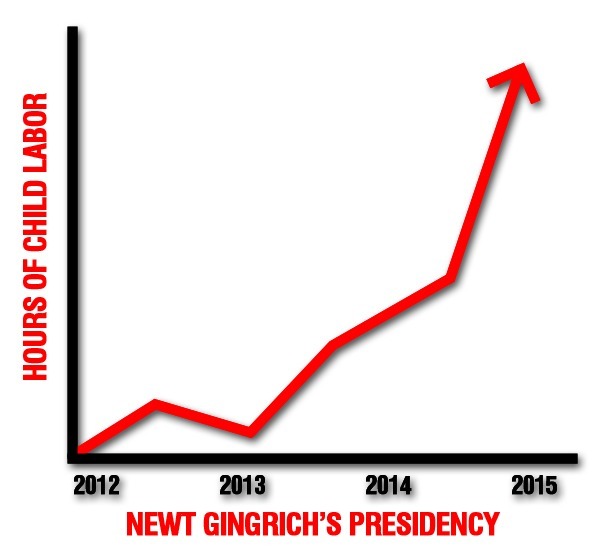 And if Newt became president? This Week in Poverty posts every Friday morning. You can e-mail me at WeekInPoverty@me.com. Please follow me on Twitter as well.